Looking for perfect hiking pants to wear on hikes is hard. The article gives you information and reviews to get the best hiking pants for women. Searching for hiking pants is easy. But finding the right pair at a good price is a little more challenging. The type of hike they are designed for as well as making sure they fit properly are important. The goal of this article is to give you the best hiking pants you can find for women that are also under $200. There are many different aspects to consider when looking for hiking pants. Each type has advantages for different types of hikes and weather. Longer hikes will require lightweight pants. While ones with ever changing weather could use water resistant or convertible pants. Knowing about the different parts and makes of hiking pants will give you the information you need to find the best ones for you. Let’s talk about the attributes that make hiking pants different. It makes up a good amount of what hiking pants are made of. This is because it is stretchy, stain resistant, and is breathable. Polyester is great for rainy or areas where there will be water in general. Water tends to slide right off. Here is a thermoplastic and silky material. This fabric is excellent for temperature regulation. This makes it excellent to wear on long hikes especially since it is really light weight. Nylon and Polyester can seem similar. To help show the differences, click the video here. It is the Spandex which is a synthetic fiber known for its exceptional elasticity. It is stronger and more durable than natural rubber. The name spandex is an anagram for "expand". Perfect for climbing so it flows with your body. Such material is a macromolecule with repeating units linked by amide bonds. This fabric has high durability and strength making it perfect for hiking pants. This is the most widely used natural-fiber cloth in clothing today. Cotton is soft and breathable. Great for any hike since it is so comfortable. Certain pairs of hiking pants will be convertible into a different type of style. One type is the roll up. You can roll up the pants and there is usually a button to hold them in place into a Capri style. Or even zippers around different lengths so your pants can become capris or even shorts. This is a great option if the weather will be changing or you are in a muggy climate. During the day you can have capris or shorts while during the night pants are great for the cold or to keep away mosquitos. Conversion pants are a popular choice for year-round hikers and outdoor adventurers. The best fit to look for in a hiking pant is one that is relatively form-fitting, but not too tight. If you get a pair of pants that is too tight they can be restrictive and that can cause chafing on the legs. This will lead to soreness and make you hike unbearable. A couple of features to look out for in your hiking pant search are articulated knees and gussets built into the crotch of the pants. Articulated knees copy the hikers walking motion by creating a natural bend in the knee area of the pants. A gusset is a patch of diamond shaped fabric that runs along the inner thigh of the pants, replacing a standard seam. This again will mimic the way you walk to make these more comfortable. There are many different features hiking pants can have. Some may not be necessary for you. Others might be the thing that will make the difference for you to have the best hike possible. Some hiking pants can come with a belt built in, most do not, but it is an interesting feature. Clearly pockets are a great advantage to have built into your pants. This will help with organization. Anything that you need quick access to, you can stick in a pocket. Some could be open pockets, Velcro, buttons, or even made with zippers. Some hiking pants offer a band of elastic around the ankles that adjusts. So you can have it tight to your ankle, or like normal pants. Even if you wanted to pull them up it is a great way for them to stay in place. Climate will be one of the top things to think about when choosing your hiking pants. Depending on where you are hiking and what will be happening with the weather you might change what type of pants you will want to wear. For desert like climates stick to sun protectant hiking pants that can be convertible. That way if it's too hot for full coverage you can have options. For cooler temperatures, any simple hiking pants will do since the temperature won't be an issue in this climate. If it is a wet climate as stated previously try some water resistant hiking pants. Now that you have educated information about the aspects of hiking pants, let's move on to review five of the best hiking pants for women. The Columbia Women’s Pilsner Peak Capri hiking pants have a 4.7 out of 5-star rating. They are made with 56 percent polyester and 44 percent nylon dobby. The price ranges from $24-$60 based off of sizing. This Capri pant has Articulated Knees as well as gussets. It offers comfortable stretching and the leg hem cinches. It offers Omni-Wick Advanced Evaporation as well as Omni-Shade UPF 50 Sun Protection. The first pro is the price since the pricing starts at $24.00 which makes it more of an affordable option. The material is a pro because polyester and nylon are stretchy making it an awesome pair of hiking pants while climbing or strenuous hikes. So is the fact that these have advanced evaporation and sun protection. This will help with any water encountered and protect you from the sun. Making it a versatile hiking pant for multiple types of climates. Articulated knees is an awesome feature for ease on your legs. Leg cinching is a plus so these capris can fit properly. Lastly, it's great that these are lightweight as to not weigh you down. These capris tend to run small so really think about which size before you purchase. You might need to purchase the next size up from what you normally wear. Consistency with sizing seems to be an issue since another con is that the sizes also seems to be different based on color. Also that they are capris instead of full pants for the elements. There is less versatility with these since they are not convertible. Yes, they are lightweight but the material seems flimsy and may not last in harsh elements. The White Sierra West Loop Trail Capri hiking pants have a 5 out of 5-star rating. They are made with 92 percent polyester and 8 percent spandex. The price ranges from $14.84-$55.00 which is based on the sizing. This Capri pant has Water repellent fabric, a Zip secure pocket, and Lightweight fabric. The first pro is this Capri pant has Water repellent fabric for wet hiking areas. Another is the Zip secure pocket for any important essentials. And Lightweight fabric for breathability and longer trips. The price is all around good even for the bigger sizes since the highest price is $55.00. That makes this an affordable option which is highly appealing. These hiking pants are not made with the greatest quality since they are on the cheaper side. The sizes seem to run a little big so keep that in mind when purchasing, you may need to buy the next size down. The Craghoppers Women's NosiLife Pro Lite Trousers hiking pants have a 4.5 out of 5-star rating. They are made with 100 percent polyamide material. The prices range from $67.19-$80.00 which depends on the sizing. Also has a NosiLife technology, SolarShield technology, and offers Moisture Control. If you are outside these trousers offer great shielding from any bugs. They are lightweight and are comfortable. The solar shield technology will protect you from the sun. And moisture control is definitely a pro to keep any wetness away. Making these very versatile style pants because they can be used in multiple climates. Unfortunately, the color of these pants are not true on the website, they are darker in person.If color is an important aspect to you bare that in mind. There is no elastic at the waist or at the leg to tie them up or cinch in. Which makes them not ideal for hiking as they are not very adjustable. The sizes for this hiking pant runs a little small so purchase the next size up. The Fjallraven Women's Vidda Pro Trousers hiking pants have a 4.5 out of 5-star rating. They are made of 60 percent polyester and 40 percent cotton. The price ranges from $142.71-$164.95 which depends on the sizing. 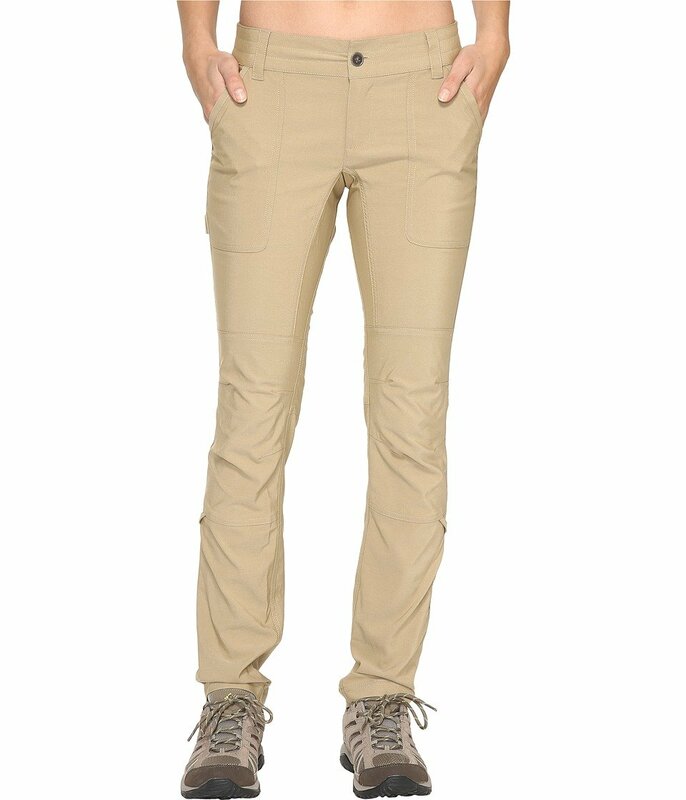 These trousers offer multiple pockets and a repelling wax in the material. The multiple pockets are a great pro for any essentials needed and keeping them close at hand. It also is great to lighten the load on your back for longer hikes.The repellent was is a huge pro since it gives a water-resistant and hard-wearing surface. They are made very well so they last and are very comfortable. The colors are nice and vibrant as well. Hard to move in if you have a lot of leg muscles because they are restricting. Also really long pant legs so if you are shorter this may not work for you unless you want to go see a tailor. The sizing overall is not quite right for women in the United States so pay close attention to the sizes. The Columbia Women's Pilsner Peak Pant hiking pants have a 4.5 out of 5-star rating. They are made of 56 percent polyester and 44 percent nylon. The price ranges from $25.31-$65.00 depending on the sizing. These pants have advanced evaporation as well as sun protection. They are a comfort stretch pant to allow your body to fit perfectly in these hiking pants. These pants offer the feature of roll up legs to convert into a Capri style pant. The first pro is the price point that starts at $25.31. Advanced evaporation is great for wet climates or rain. Sun protection technology is great for sunny environments or hot climates. The conversion feature is also certainly a pro to help for coolness in different climates. Great durability for outdoor use. The colors are also vibrant and nice quality. Sizing is inconsistent for fit so pay close attention to the sizes. They also tend to stretch out a bit after a while of wear, so keep that in mind when choosing sizes as well. In conclusion, after reviewing these five different types of hiking pants there is one that stands out. The Columbia Women's Pilsner Peak Pant are the best hiking pants for women. For starters, the price range makes it a more affordable option while still maintaining great quality. These hiking pants are also great for protecting against the sun and any wet climates making it great for multiple different types of weather and situations. One of the greatest qualities of these hiking pants is that they are convertible. As stated above, the convertibility of hiking pants is a huge bonus. It gives the versatility to be in multiple climates so if you want to hike in different areas and can only take one pair of pants, these should be your go to. The versatility of these hiking pants is why they are the best hiking pants for women. A lower price tag does not have to compromise quality, and these hiking pants show it. Top Five Baby Hiking Backpack, #5 will Surprise You!